Technicolor Kitchen - English version: Chocolate peanut butter cheesecake bars + "Man of Steel"
Chocolate peanut butter cheesecake bars + "Man of Steel"
The beautiful teaser comes with some cheesecake, a delicious peanut butter version by the always amazing Nigella Lawson . To me, the chocolate glaze was unnecessary on the dulce de leche cheesecake bars I made a while ago, but here it’s perfect: the peanut butter has a slightly salty flavor and the milk chocolate compliments it beautifully. Preheat the oven to 160°C/325°F. Lightly butter a 20cm (8in) square baking pan then line the bottom and sides with 2 pieces of foil, leaving a 5cm (2in) overhang on two opposite sides. Butter the foil as well. Base: process the biscuits until ground then add the butter; process again until mixture resembles wet sand. Turn it out into the prepared pan and press into the bottom to make the crust. Put in the fridge while you make the filling. Filing: place the cream cheese, eggs, egg yolks, sugar, sour cream, peanut butter and vanilla in the clean bowl of the food processor and process until very smooth. Pour into the base bake for 1 hour, though check after 50 minutes: the top – only – should feel set and dry. Warm the sour cream and chocolate with the brown sugar gently in a small saucepan over a low heat, whisking to blend in the chocolate as it melts, and then take off the heat. Spoon and spread the topping very gently over the top of the cheesecake, then put it back in the oven for a final 10 minutes**. Once out of the oven, let the cheesecake cool completely in the pan over a wire rack, then cover and refrigerate overnight. Carefully lift cheesecake from pan using foil overhangs and cut into 16 squares. 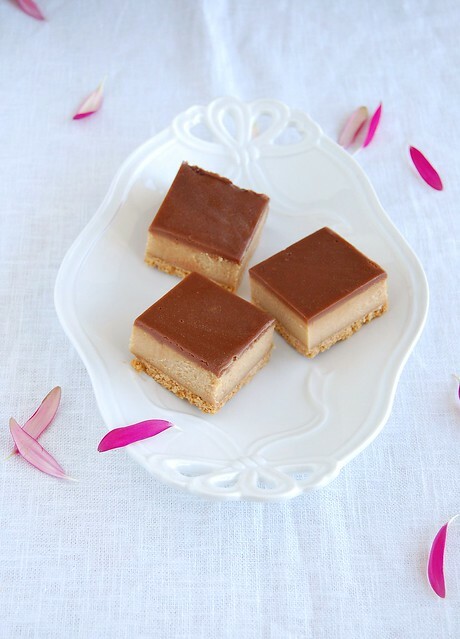 Nothing's better than chocolate with peanut butter, these bars look fabulous! So looking forward to Man of Steel! !